Upon reading the past couple of issues, it’s hard not to feel that The Flash has recaptured some of the great feeling and momentum of the early books. The writing especially is reminiscent of John Broome and Gardner Fox, the two writers in particular who set the templet for what was to come. With this issue, it starts with the terrific Nick Cardy cover and it’s evocation of the frontispiece of issue #115 where we saw Grodd in his human guise of William Dawson firing a weapon at the Flash as he runs by transforming him into an altered form of himself. It continues with the fact that the villain firing from the building is Mr. 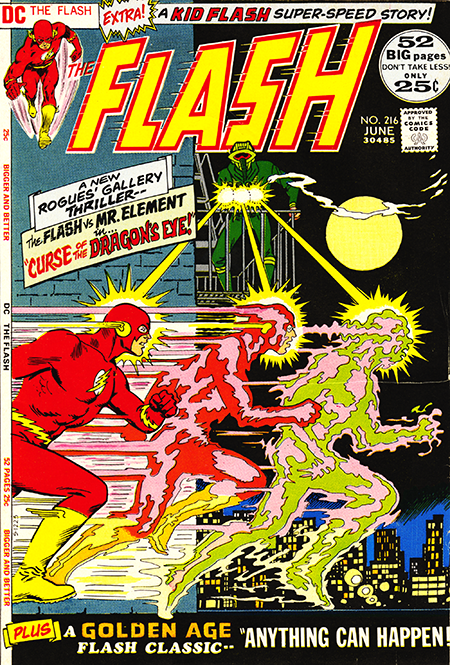 Element, again, one of the Flash’s earliest antagonists. Like the previous two rogues gallery villains Abra Kadabra and Vandal Savage, Mr. Element remains true to, or returns to, his established character. Not only is Mr. Element the villain we all know and love/hate, but writer Cary Bates expands upon his back story in a very credible way. We learn that his father, Peter Desmond, was an astronomer and also the owner of a strange gem known as the Dragon’s Eye. When he discovers a pulsating star in the Dragon constellation, a beam from that pulsing start come through Professor Desmond’s telescope, hits the ring, and then his infant son Al and installs the evil rampages that will lead the emergence of Mr. Element and set him up for a lifetime of therapy (when I said “credible”, by the way, I meant that in the broadest comic book sense… really broad). My only knock on the story at all is that, while attempting to discharge the negative energy from the ring, the Flash spends an inordinate amount of time in outer space which, even though he did this before in the good old days, always seemed like a leap too far. But, all in all, the story represents a welcome return to form. It even ends, as it has so often, with Al Desmond returning to the ranks of the good and vowing to be rid of Mr. Element for good… which we all know ain’t gonna happen. Which is what we love about it. The Kid Flash story shows him arriving for a college orientation where he runs into some dimension-hopping aliens who are abducting faculty and students to be used as slave labor in their dimension. So it looks like college is going to be pretty much like high school for the “kid”. I do like the aspect of moving Kid Flash along in life rather than permanently being stuck as a teenager. It opens up a new world of possibilities. Hmmm… is there a lesson in there?